WASHINGTON, D.C. -- In September, Americans are most likely to name dissatisfaction with government, the economy and immigration as the "most important problem" facing the country, although no one issue is named by more than one in five Americans. Mentions of the government and immigration are up slightly from August. 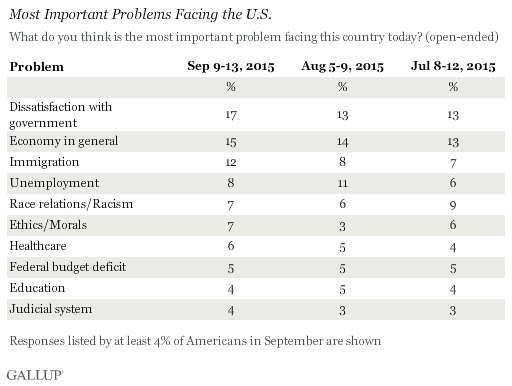 Gallup's monthly inventory of Americans' responses to the question "What do you think is the most important problem facing the country today?" shows that government and government dissatisfaction were listed by 17% of Americans in September, while the economy in general was listed by 15% and immigration was listed by 12%. Fewer than one in 10 Americans named all the other responses. A similar lack of consensus was found in August, with no single issue dominating Americans' minds. The relatively high percentage of Americans who nominate immigration as the top problem may reflect the emphasis it has received in Donald Trump's presidential campaign. However, the current migrant crisis in Europe and the surge of young immigrants from South America in the summer of 2014 may have also influenced this uptick. But economic problems are still a major factor in Americans' minds, with a net of 35% of Americans mentioning an economic issue. Since November 2013, the economy and dissatisfaction with the government have typically been among the top-ranking problems, at times joined by unemployment, immigration and healthcare. In the past, certain issues have dominated Americans' responses, often corresponding with major events. For example, during the economic downturn, mentions of the economy or unemployment dominated, and during the latter years of George W. Bush's presidency, the situation in Iraq typically topped the list. 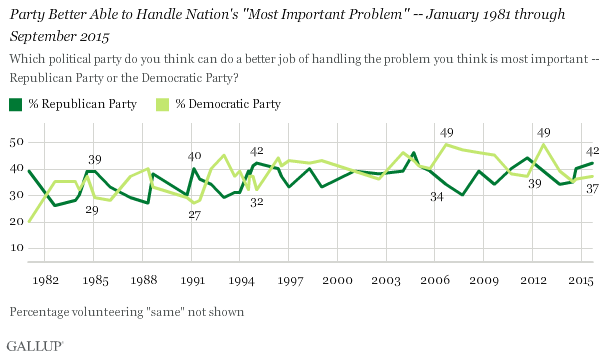 In a follow-up question, Gallup asked Americans which political party they thought could do a better job of handling the problem they named as most important, and the Republican Party emerges with a slight edge. Specifically, 42% of Americans say the Republican Party would do a better job, while 37% say the Democratic Party. Another 23% volunteered that the parties would do the same job, that a third party would do a better job or had no opinion. Gallup has asked this question on an occasional basis for decades, with a great deal of variation in the responses. Republicans were more likely to be named as the best party to handle the problem in 2014, the parties tied in 2013 and the Democrats were on top by 10 percentage points in September 2012, reflecting Democratic strength in a presidential election year in which Barack Obama was re-elected. But, by way of comparison, Republicans enjoyed a seven-point lead in September 2011, more than a year ahead of the 2012 election, indicating that the current views of party strength are not necessarily predictive of results in the 2016 presidential election. Among those mentioning the government as the top problem facing Americans, Republicans have the edge as the party deemed better able to handle it, 45% to 34%. Republicans also lead among those who mention the economy as the top problem, 43% to 38%. Those relationships are confounded to some degree by the greater tendency of Republican Party identifiers than Democratic Party identifiers to mention these issues as the top problem facing the country. On issues Democrats are more likely to name as the most important problem, for example race relations, the Democratic Party is generally viewed as the party better able to handle it. Unlike 2004, when Iraq was the dominant issue or in 2008 when the economy dominated, the 2016 presidential campaign may be fought over a variety of issues. Donald Trump has made immigration a major campaign issue, and this is an issue that Americans more generally tend to perceive as the most important problem, along with the economy and the government itself. Also, the fact that outsider candidates like Trump and Ben Carson are doing well in the polls at the expense of candidates with government experience could likely be a manifestation of people's dissatisfaction with the government. Usually, the party that is seen as better at handling the most important problem is the one that wins the election. Just over a year out from the presidential election, Republicans do hold a slight edge on that. However, they had a similar edge in 2011 and lost it before the 2012 election. Much could change between now and the election next year, and it is quite possible that a single issue could rise to prominence in Americans' minds as the most important, and that Americans' perceptions of which party can better handle this problem could shift.